Sorry it has been so long since my last update. I have been busy. This guy jack came along and sold me some beans. I ate them and I got huge. OK not really it is just an optical illusion nah that is not right either. Really I figured out how to use photo shop. WHoo Hooo photoshop. 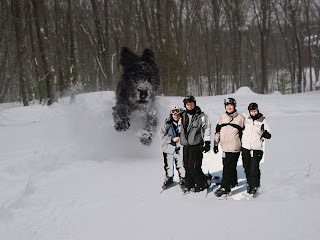 There has got to be a market for a dog who can use photoshop. I bet Conner can't even type. If you hear of anyone looking for a dog who can use photoshop please let me know. I still need $275 for the seatbelt incident. P.S. Joey you still owe me $5.